Counterintuity was tasked with creating a website and ongoing social media and SEO plan that would promote the Spatial Sciences Institute and its BS, MS, PhD, and certificate programs. While revolutionary in their methodology and approach to world problems, these academic programs are also quite niche and need to be promoted to very specific users. 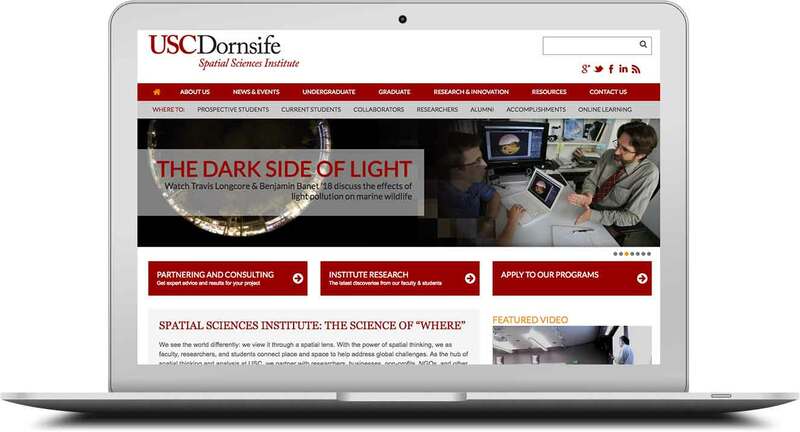 As a longtime marketing partner of USC Dornsife, Counterintuity has played a role in the growth of nearly every one of the Spatial Sciences Institute’s programs. In the past year, the USC Dornsife Spatial Sciences Institute has seen its base of Followers grow by over 25% with their interaction rates increasing by 30%. Our website updates and SEO work have helped the Institute’s website increase in page views by as much as 40% from past years, with the most recent month clocking in an all-time high number of page views – just a touch under 10,000.